The GDS-1062 isÜa powerful DSO while still being extremely affordable. Operating at up to 100 MHz with 250 MSa/s (real time) and an astonishing 25 GSa/S ET(Equivalent Time) sampling rate, it is both quick and versatile. Built with a 5.6" color TFT LCD display and featuring 4000 point long record lengths, the GDS-1062 DSO provides an excellent balance of performance, memory length, sampling speed, and ease-of-use. Other major features include user-friendly menu tree operation, compact size, ergonomic design, PC connectivity,Üconvenient SD card memory storage, and a Lifetime Warranty (limitations apply), all as standard. 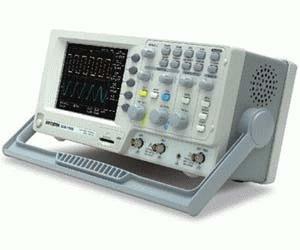 The GDS-1062 DSO is designed to meetÜthe most demanding budgets and engineering requirements of today.